We are just about at the tail end of winter, there is still a nip in the air and some snow on the ground, a great way to warm up and calm down is hot stone massage. At Brilliant Bodywork a hot stone massage is a 90-minute service that incorporates hot stones into the massage therapy. When you warm up with hot stone massage there are many benefits to enjoy. Hot stone massage is a therapeutic massage that promotes deeper muscle relaxation and healing of damaged soft tissues throughout the body. The massage therapist incorporates smooth, flat, heated stones during the massage. The heat of the stones allows the muscle to loosen and the massage therapist to work deeper into the muscle helping relieve stress and tension in the muscle. The stones may be used either by placing them on the body in different areas or as a tool, held by the therapist to massage and manipulate the tissues and muscles in the body. The massage therapist may use a combination of both the techniques with the stones. If the stones are placed on the body they are placed along the spine, on the chest, on the stomach, the face, the palms, or feet. 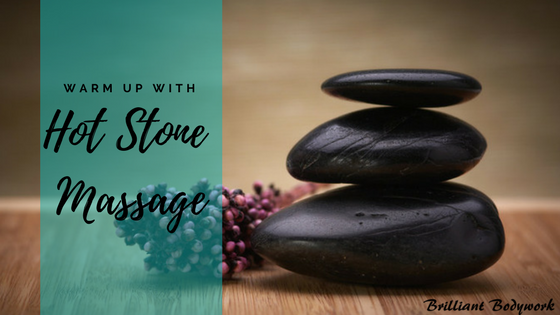 Hot stone massage is a very effective and relaxing form of massage therapy that works to melt away stress and tension, ease muscle pain and tension, and increase metabolism and circulation. Not only does it incorporate the hot stones, but the massage therapist also uses traditional massage techniques as well to offer a customized massage experience. Hot stone massage not only uses the heat of the stone to allow the therapist to access deeper into the muscle layers, but the heat from the stone also expands the blood vessels encouraging better blood flow through the body. The hot stones also encourage deeper relaxation which helps to reduce stress and promote a calm and peaceful feeling. Next time you head outside, and the cold winter air is leaving you chilled, come warm up with a hot stone massage. Treat yourself to a massage that will warm you up and treat your body to deep healing, relaxation, and renewal. To learn more or to schedule your appointment please visit us here- https://www.brilliantbodywork.com/massage/types-of-mass... or give us a call at (608) 783-8380.